This is a really useful thing to keep in mind when meeting people. They know something you do not. Diana’s Baths are a series of small waterfalls in the southeastern part of the White Mountains near North Conway, Hampshire. Sarah and I hiked around this gorgeous place and took several photographs, but this one, by Alex McLeod, captures the beauty far better than our images. If you’re the smartest person in the room, you’re the one least capable of learning from others in the room. I’d rather be the dumbest person in the room. 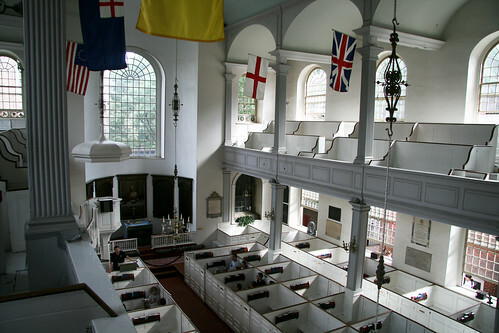 The Old North Church (the “one if by land, two if by sea” church) in Boston is an amazing place to visit, both from a historical and an architectural perspective. My photos of the church were washed out, but this wonderful shot by Tim Sackton captures the place quite well. Focus on what you can control, not what you cannot control. This is the best possible advice for people starting off in their careers. If you have no other responsibilities than yourself, always choose the option that gives the most valuable experience. The key is to fix homes, and he seems to mean that in many different dimensions. He’s obviously referring to the physical structures, but there’s also reference to the social structure, as well. Your thoughts on politics, spirituality, history, and everything else do more to outline you as a person to others than they do to actually influence their views. This is some interesting insight on how observing patterns in data can help us tell what’s coming, at least in the short term. If you’re spending all of your time being careful to save face, you’re never doing anything exceptional.